Hydrotex™ Filter Band Concrete Linings have interconnectued tubular concrete elements. They provide Hurricane Storm Protection erosion control and are a permeable concrete lining for waterways such as channels, canals, streams, rivers, reservoirs, marinas, ports, harbors, ditches, ponds. The filter bands act as drains, the linings have high coefficients of hydraulic friction, achieving lower flow velocities and slowing wave run-up. 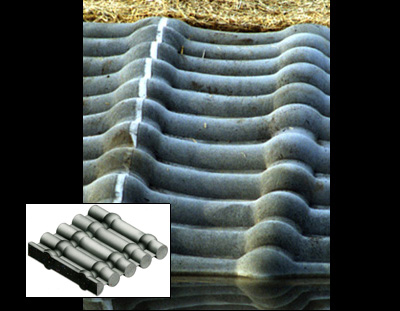 Filter Band Concrete Linings consist of interconnected, tubular concrete elements that are connected by large, interwoven filter bands. The filter bands lessen hydrostatic uplift pressure and add stability. Filter Band Concrete Linings offer greater relief of uplift pressure and higher coefficients of hydraulic friction than the Hydrotex Filter Point Concrete Linings.